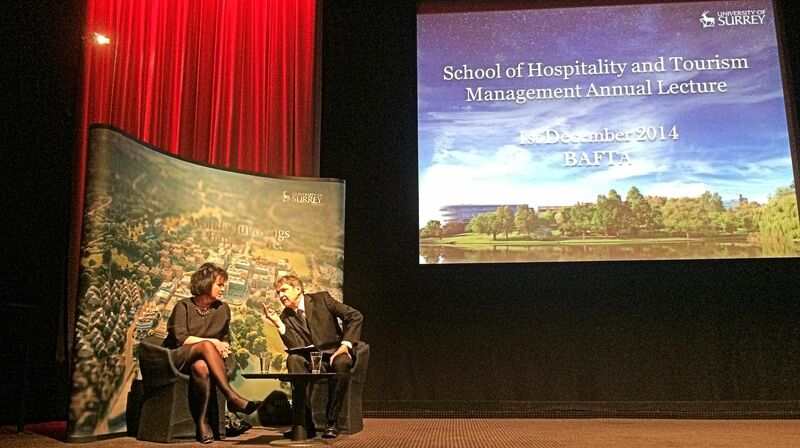 Chris Browne, chief operating officer of TUI Aviation, delivered the annual University of Surrey School of Hospitality & Tourism Management lecture in BAFTA’s Princess Anne Theatre on Piccadilly last night. Chris talked about her recent promotion from MD of TUI’s Thomson Airways to COO of all five of TUI’s airlines and the job she faces in pulling all these separate airlines into one organisation. The bulk of her lecture was devoted to the enormous task she and her team at Thomson Airways had faced in bringing the Boeing 787, the Dreamliner, into service. Thomson were scheduled to be the first British airline to take ownership of this new and highly advanced passenger jet. Chris explained that Thomson wanted the aircraft primarily due to the enhanced passenger experience it promised Thomson’s customers but also because it’s new technology was expected to deliver significant reductions in emissions and fuel consumption. The Dreamliner was at the very cutting edge of aviation and the risks associated with such new advances soon manifested themselves with prolonged delivery delays and then with multiple technical issues once the planes got into service. The story of how Chris and her team dealt with the project and their ultimate success was very impressive. Ian Taylor, executive editor of Travel Weekly, then interviewed Chris about her incredible career. From growing up in Strabane in the 1970s (Strabane was the most bombed town in Northern Ireland during the Troubles), to working with Spain’s Iberia Airlines, to joining First Choice Airways as MD and her elevation to running all of TUI’s airlines earlier this year. Chris’s commitment to customer service, to sustainable tourism and to her passionate promotion of gender equality were all clearly on display. But what I want to remind people of is her unwavering support for those hard-working but struggling families for whom a flight on a Boeing 787 really is just a dream. Chris has supported the work of the Family Holiday Association for many years and we were delighted when she recently accepted the role of charity patron. Supported by Chris and her wonderful cabin crew, Thomson Airways passengers have been donating their spare change through in-flight collections since 2009. In that time they have raised an incredible total of almost £2m. That money has gone to help provide simple breaks at the British seaside for tens of thousands of children and parents who otherwise might not have been able to even afford a day out. The Family Holiday Association is incredibly lucky to have a champion like Chris Browne, someone who understands that Holidays Matter and matter profoundly for those who can least afford one. < Getting a break can help with getting a job!